Nowadays, you need to have some unique skills if you want to beat an experienced opponent. You need to have special knowledge which is not presented in chess books. Some strong players know these weapons, however they will never tell them to you. Nevertheless, now you can get this knowledge from the course How to Beat Titled Players . This course should not have been created. Actually, I wasn't going to share this information with a huge audience. I've had doubts about whether or not I should give such a powerful chess weapon to everyone. After all, I am also a titled player, and I don't want everyone to be able to beat me! So why have I created this program? Well, it is for your merit! I have received a lot of e-mails with the customers' gratitude for my previous courses. It has motivated me to create something highly valuable for you. Here it is. Today, there is an overabundance of chess books, CDs, and other educational materials. That's why every serious player knows all the chess basics. Everyone knows what is "a weak square", "the center", "a fork" and other well-known strategic and tactical motifs. The quantities of strong players have considerably increased in the last few years. They play well. The problem is that all of them study the same chess books and programs and accumulate similar knowledge. That is why at a certain stage of your chess development you are faced with a question "How to beat an experienced opponent?" That's why we can often only make a draw (as the best result) against a stronger opponent. Of course there is. You know that everyone loses. Even a strong Grandmaster loses games sometimes. It means that there is a way to beat him. Pretty often, a weaker player wins against a stronger opponent. Again, it means that it is possible to do. The question is "HOW can you do it?". How can you beat a titled player or a player whose rating is 100-200 points higher than yours? To give you a key to success, I have decided to create such a chess program. It took about 3 months to present my knowledge and experience in an integral and compact product. Now with pride I am presenting the course How to beat titled players . The general concept about how to win against titled players. Why most players can get only a draw (as the best result) against a stronger opponent. How to beat a player whose rating is 100-200 points higher than yours. 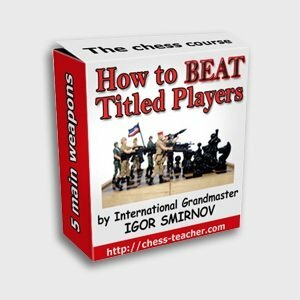 How to break the well-known chess "rules" to get great results. How to use the weaknesses of your opponent's psychology to gain a victory. The secret of strong players, which they use to beat titled players. How to make your opponent feel nervous. Boris Spassky's secret regarding beating strong opponents. What is the most effective style of playing? How it is possible to create an attack against a strong opponent. Why most attacking attempts fail. How to detect the opponent's mistakes and use them. The exact system of thinking, which will allow you to find the most powerful attacking ideas. What you should do in case your attack doesn't work. How to easily detect whether your attack will be successful or not. How to break the defense of a titled opponent. What, when, and how exactly you should attack to gain a victory. The one extra secret, which will help you to make your attack much more effective. How to get the extra skills, which most chess players (even pretty strong players) don't have. How to use the common stereotypes to make unpleasant surprises for your strong opponents. How to find the unexpected moves regularly. How to play when your strong opponent is pressuring you. How to find the good moves even in very dangerous situations. The secret of strong Grandmasters, which allows them to play successfully in a very risky style. Why the strong players are able to stay calm when they are under an attack. How to find the moves missed by your opponent. The exact rules of thinking, which will allow you to make very unpleasant moves for your strong opponents. Why it is necessary to create problems for your opponent always. One great advantage over most chess players, which you can get easily. How to complicate a position to get more winning chances. Why do the strong players always make complications. You will understand better how to choose the right openings. How to win the game when your strong opponent is playing for a draw. How to play safely in a risky style. Why some strong players lose some positions easily and quickly. How to find the right moves in unbalanced positions. You will study how the strongest players evaluate a position. How to find positional sacrifice ideas regularly. How to beat titled players in the opening. You will be able to choose the best direction in the complex positions. The positional sacrifice, which works great nearly always. How to find the powerful ideas, which seem impossible. You will avoid one great mistake which stops most players from beating stronger opponents. One secret of the former Soviet chess school, which makes your game much more powerful and allows you to play much faster. How to find the best places for your pieces. How to make an effective positional sacrifice in an opening. The powerful positional sacrifice idea, which most players don't know (and there is no information about it in chess books). Lesson-6: "The Fifth Weapon". This weapon is one of my favorite ones. It is quite simple (when you understand it) and extremely effective at the same time. I am sure that you will use it with great results. How you can confuse your opponent and force him to make mistakes. One great delusion of most chess players. How to break the plans of a titled player. How to think during a chess game to have a 100% guarantee of a good result. Why A. Karpov lead by a score 5:0 against G. Kasparov in their first World Championship match. The great idea, which helps to find good moves in any positions. How to use a prophylaxis to win the games. 100 special tasks and games for your training. These special tasks are intended for training your practical skills. We will start from quite easy situations and then go to examples on the top Grandmasters' level! The detailed instructions about what and how exactly you should train. It will help you to train yourself properly and to get the best effect from the program. The concrete examples with commentaries about how exactly you should apply 5 winning weapons in different situations. It is very important to know how exactly you should apply the received knowledge in practice. With my commentaries, I will show you how exactly you should think to use the course's ideas in your practical games.